I have been watching a lot of cooking Youtube videos lately, and finally made some cinnamon rolls. I was always intimidated by the yeasty bread recipes, but now that I have made a few loaves that have sat overnight before baking, I feel like I can take this on. 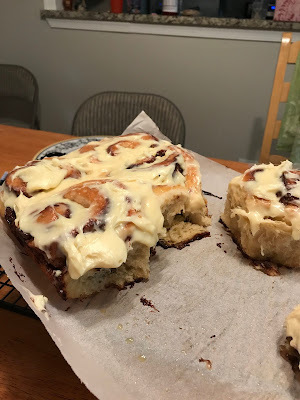 The recipe I tried is from Gemma Stafford, and the dough sits overnight, then you roll it with the butter-sugar mixture, slice it up into rolls and let them rise a while then they're baked. I used more of a frosting than a glaze this time. They were amazing! The sugar-butter mixture melts down and caramelizes and candifies the bottoms of the rolls and the breadyness is so good. I used the same recipe the following week to make plain dinner rolls, those turned out so good.